For those living in extreme cold winter conditions, this article from NoTech Magazine may be of interest. Dated from 1995, it analyzes the capabilities of three different types of winter clothing in maintaining warm body temperatures in extreme cold (-28 degrees Celsius) for extended periods of time. 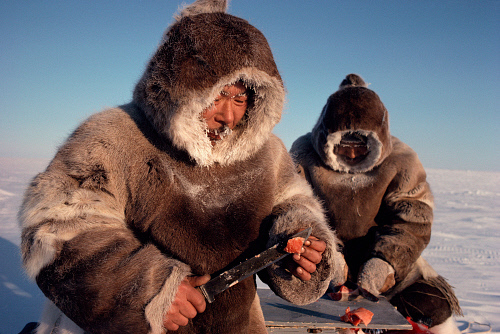 The three types of clothing are described as expedition, military and the caribou skin as used by Inuit peoples in the far north. Below are some excerpts from the article, which can be viewed as a PDF: Caribou skin cold weather clothing. Inuit woman’s caribou skin clothing, from Baffin Island, 1927. “All garments and footwear were rated for use at -40°C (unspecified activity level and conditions). Subjects wore the same cotton/polyester underwear, wool socks, cotton/polyester turtleneck shirt, and wool toque, under each ensemble. 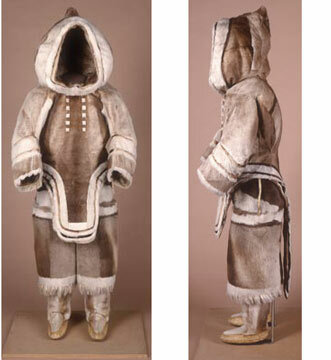 The caribou skin ensemble consisted of an inner and outer caribou skin hooded parka, caribou skin outer pants, caribou skin stockings worn inside seal skin boots, and caribou skin mittens. The hood was trimmed with dog fur. The ensemble was made from hand-scraped rather than commercially tanned skins taken from caribou killed in late August in the Arviat area of the Northwest Territories. The inner layer was worn with the caribou hair next to the subject’s body, the outer layer was worn with the hair to the outside. “The use of caribou skin boots would have increased the insulative value of the footwear. Both caribou and seal skin boots are used by Inuit while travelling on the ice in winter. Caribou skin boots and overslippers are usually preferred for extremely cold weather (below -40°C). “The expedition ensemble provided (by Blue Skys Ltd) included an inner and outer hooded parka, pants, wind pants, and mittens. Each item consisted of 4 layers: a nylon lining, open mesh nylon interlining, 6 mm layer of Thinsulate, and a Gortex nylon outer layer. This was a specially made ensemble for arctic travel. Rubber-soled boots (commonly called ‘Army Mukluks’ or ‘Skidoo Boots’) with white, nylon leg sections and lace-up closures were worn with composite liners (provided by Kauffman). 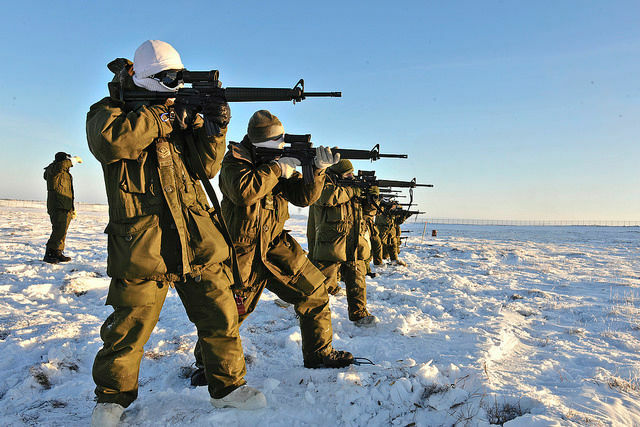 Canadian Forces soldiers carrying out Arctic training in winter clothing used for testing in this article (the CF obviously has newer improved versions of extreme cold weather clothing today). “The 1991 arctic winter Canadian military ensemble (provided by the Department of National Defence) included an inner and outer hooded parka, pants, wind pants, and mittens. The inner and outer pants were made from uncoated nylon canvas outer shell with an nner layer of Polargard (100% polyester) and a layer of Dermooflex (coated fabric) lined with Nomex (a plain-weave natural-coloured fabric). The parka (outer layer) and jacket (inner layer) were made from coated fabric (Dermoflex) and lined with Nomex. The parka also had a Polargard (100% polyester) insulation layer. Mitts, made of the same layers as in the parka, and ‘Army Mukluks’ completed this ensemble. Posted on February 9, 2015, in Warrior Fieldcraft and tagged Arctic clothing, Caribou skin, cold weather clothing, extreme cold weather clothing, Inuit, Inuit caribou skin clothing, parkas. Bookmark the permalink. 1 Comment.